A tribute to meditation teacher Sri Chinmoy, who passed from this world on October 11th, 2007, aged 76. I couldn’t sleep on Thursday night. I suppose you could give reason its name—a strange mixture of tiredness, utter wide-eyed awareness, keeping body and mind awake. Some would it insomnia. But oneness is the term I prefer. 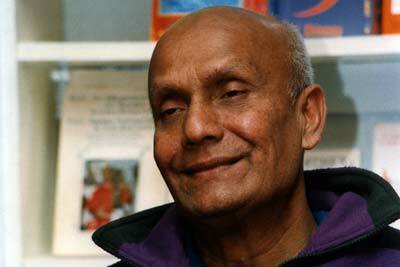 Half a world away, at the very beginning of the day before, my beloved Guru Sri Chinmoy left the earthy stage. It does not seem strange that I, who likes nothing more than to write, was at the opposite end of the world, already up and with pen in hand. In the early hours of that morning, I was possessed by a burning, shining inspiration to write. It seems now as if I was challenging, with pen alone, the darkness of the night. He had been unable to sleep during his last few days, and for the most part so had I. But, to what would have been his joy, it was not the cruel grasp of pain that kept me from closing eyes. In fact, something completely the opposite. That week, as though new born, I was held within the gentle arms of the most intense, most happy time of my life, spiritual experience after experience raining, drowning upon me, as if waves upon a raw and tender shore. As if the one, true ocean of reality was drawing to and fro, slowly, gently ever-near. The writing of it started immediately, then and there, and will continue on to completion—even if it takes a thousand years. Thursday October 11th, at approximately 7.00am in the morning EST, and the day after my 33rd birthday, my Master passed from this world. Grief, bewilderment, regret aside—for the tears, racking sobs came thick, torrential at first—there were immediate concerns, necessities to attend. I live in a household, modern day ashram of meditation students, and had to wake each and tell them the news; cancel an early morning restaurant shift, for the owner called and, through incomprehensible tears, asked me what to do. To me at least, what to do was clear enough. I am a brother in a spiritual family. I had a duty to do. But it was the most painful, heart-rending thing that morning, breaking the news to friends—brothers in truth—I the person to tell them the dearest person in their lives, of their Life, had passed away. Far more painful than my own grief, for in one I literally saw something break at the news. Thankfully, there was someone other than myself to take care of the bigger picture, make immediate arrangements and plans, and we were soon on our way to a hastily called meditation. Outside, as though right on cue, the heaven’s opened, and the rain began to pour. The water could not fall any faster, and I could not drive any slower, for the roads, streets, entire land even, were swimming in deepest tears. And yet, two hours later, meditation over and a tender, snow-white happiness beginning to frame grief and despair, darkness passed completely from the sky, and, as it does, always does, the sun began to shine. The sun, like his love in our hearts, continues to do its duty. Inside my, your, our hearts, Sri Chinmoy will shine forever still. I too had to tell new students at our Centre. Not a task I would like to repeat ever again—shock, total disbelief, tears and more tears. I tried to comfort all, to assure them that all they needed to do was to “go within” to feel God’s love and compassion. Students have rung me in tears, also in disbelief. Once again (why me God!) I re-assured them that all Sri Chinmoy would want at this time is their happiness, and if they are to hold him in their hearts, he would console them. Thank you Shane and Sahayak for your comments. I think we are agreed that this is an experience we will likely never repeat. very moving post – I found the weather metaphors especially touching. Thank you Sharani. I hope that it is not my pride talking when I say that this is one of my better pieces of writing. It certainly tried to be authentic.